It's such a good feeling: Riots. 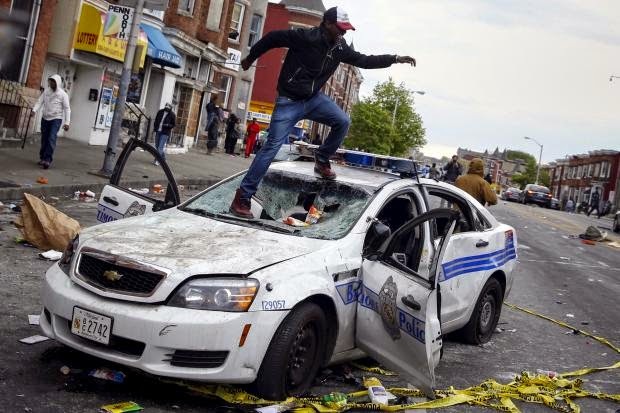 Today, there were riots in Baltimore. Baltimore. So close to home. Where my brother went to college. When I saw the news on the internet, I couldn't help thinking, How come I didn't know? Shouldn't there be something in my heart that stirs when people get so sick and tired that they pick up bricks and throw them at each other? When people don't know what to do except kick in windows? Shouldn't there be something in my heart that stirs when police officers wake up for a normal day of work and end up lying next to each other in hospital beds? Shouldn't there be something human in my heart that stirs? Some buzz in the air that makes it over the Rockies to where I am? How can there be riots in Baltimore without some analogous change in my day? I guess our hearts can't be so cosmically tuned in to human suffering, or else we would never do anything but suffer.